I think the accomplice angle has little or no weight. It sounds good on paper, but it's just the stuff of conspiracy theories and television. For starters, it would only make sense if he were doing something that seemed impossible or very difficult to accomplish on his own. Cheating at races is not rocket science. When you combine his delayed start, overdressing/disguise, odd splits and missing nearly all of the photo opportunities, what is there not to understand? Second, it is rare enough that there is one person willing to go through such extreme and bizarre measures to gain only a slight amount of notoriety. What would be the chances that there are two people conspring together so that this one person can have faster race times? Possible? Yes. Likeley? Not a chance. If someone reported a runner jumping on and off a course they wouldn't have a bib number because Kip's careful to cover it up, so they'd only be able to describe his outfit. When Kip is done with his short-cuts, he puts on a different outfit and finishes the race. 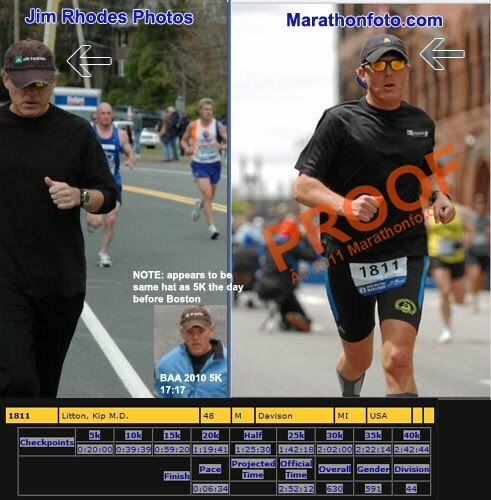 The description of the cheating runner no longer matches him, and since his bib was covered there aren't any pictures that link the earlier outfit and course cutting to him. yeah, that's why you place the bib over your nutsack and let it hang there and cover the whole outfit up with a snowsuit for the early parts. act like you're not competing, then strip and hop right in for a cheering finish!!!! The bandana is for the hair disguise. He lets it out later in the race so no one sees it and can describe it, just in case. Ballcaps are in case he's seen by a bystander or another runner, his finishing photo won't have a distinct color, aka opposite of what someone saw. 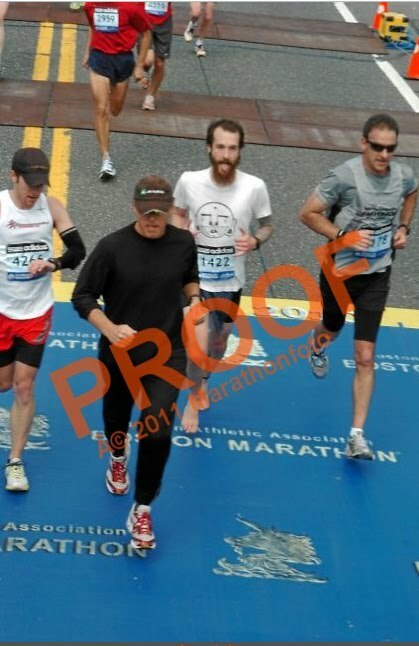 Notice how he "looks down" as if he "KNOWS" a photo is being taken (30k in Boston). Well of course he knows at certain points and he hides his face as much as possible. Again, hiding in the back is so no one will recognize him. He couldn't maintain their pace either, so why start with them, even if in disguise. 5 hour marathoners won't be around when he finishes. He's long gone by that time. Sorry, I still have a hard time believing that he even ran 1:28 for a half when I look at his body mass, face, and frame. Call me cynical, but until I see a video of the entire race, I won't believe it. Who rode the bike, his friend? Here is my theory: Kip and Ben? traveled to Boston together. They pick up the race chip and then program a second chip with the same code. They take two cars and leave one at the 5k point. Kip starts the race, hits the start and the 5k mats, hops in his car and drives to the 15k mat. After dropping Kip off at the start, Ben drives to the 10k mat. Waits until the right time and then sets it off with the 2nd chip. Kip runs from 15k to 25k. Ben sets off the 30k marker and Kip is back in the race from 35k until the finish. So overall Kip ends up running a 20' 5k, a 43' 10k and then a 30' 7k with nice 40' rests in between each section. The only questions that this theory still leaves unanswered is why Kip appears to be going so slow in the 20k photo. Anyone have any experience with programming chips. How easy would it be to program if you know what your doing. Or maybe he reported it lost and had a second one issued. ...Sorry, I still have a hard time believing that he even ran 1:28 for a half when I look at his body mass, face, and frame. Call me cynical, but until I see a video of the entire race, I won't believe it. Who rode the bike, his friend? Agreed. 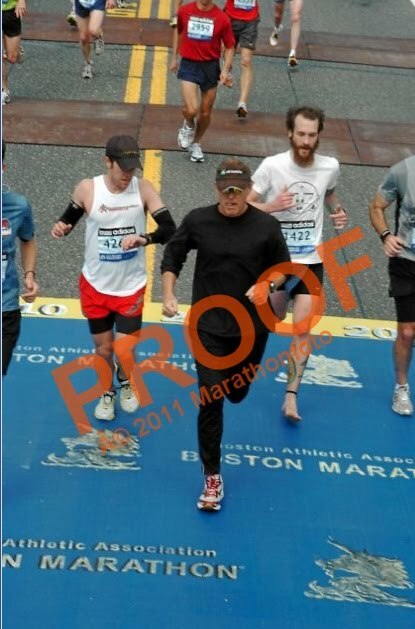 If memory serves, I believe he gained some credibility of being capable of a 2:5x marathon in the original thread. Problem is, that was based on the West Wyoming marathon results, which was recently determined to be a fraud. At this point, I don't know of any race result of his that is certain. I guess that's the 30k photo. So that would help explain it better. Ben hits the 25k mat and Kip jumps in at 30k and runs to the finish. Don't know about programming, but I think you're on to something there. Body type isn't necessarily a good indicator of speed. I've seen some very talented "chubby" guys (at least compared to typical anorexic runners), that make you say -" if you lost 40 lbs I'd hate to see what you'd do". HOWEVER looking at kipster's progression at Boston (which is almost credible ). You think he was getting leaner and leaner, especially given his age. For example for me to progress steadily in my 40's I need to train harder AND get leaner. Age is working against all of us, but he gets faster. NOT Kip. 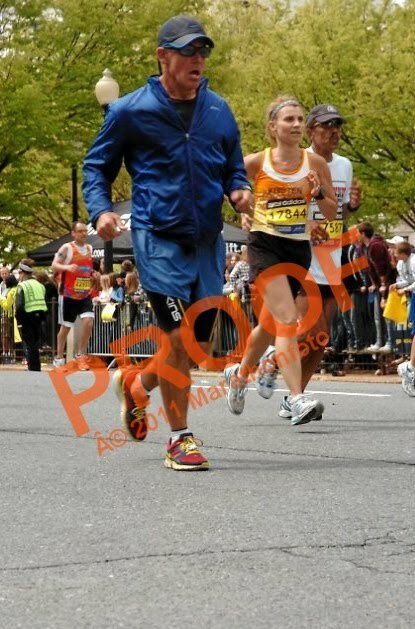 Check the matching foto from the marathonfoto list we've built. There's a ring on this guy's right ring finger but none on the pics we confirmed as Kip. Eventually when the truth hopefully comes out, we will know if there were accomplices. 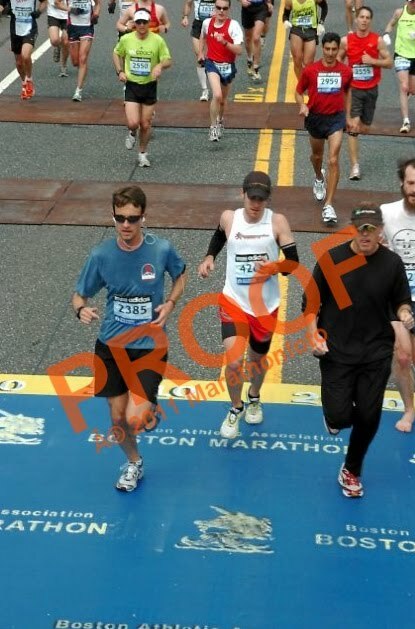 I surmise he could have chose to post a good (bogus) time at Boston (as opposed to a smaller venue) to have the adoring massess, ie charity contributors, think of him as this marathon hero, capable of tackling the venerable Boston course even on scant rest, even with doing a 17 min 5K a mere 1 day prior. Remember he was talking of raising 250K for CF with the proceeds going to his website first. Thus, it is possible that there are other complicit in his adventures. Kudos to the guys who dug up the random pictures! I have nothing to contribute except I just wanted to change the title from hereafter because it was bothering me. Well done, Letsrun! We haven't all banded together like this since Eddy Lee broke 4. I love how now we're now turning that awesome force AGAINST someone this time. It is obvious his accomplice is hiding behind the grassy knoll.